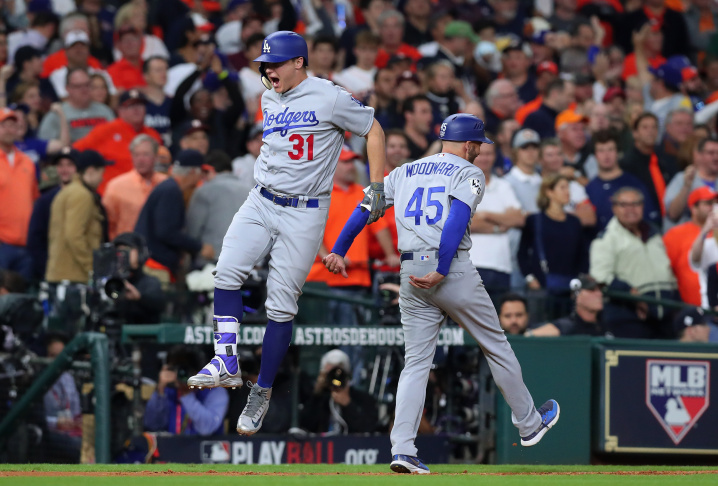 Joc Pederson of the Los Angeles Dodgers celebrates after hitting a three-run home run during the ninth inning against the Houston Astros in game four of the 2017 World Series. A view of Minute Maid Park in Houston, Texas as Charlie Morton of the Houston Astros pitches during the first inning against the Los Angeles Dodgers. 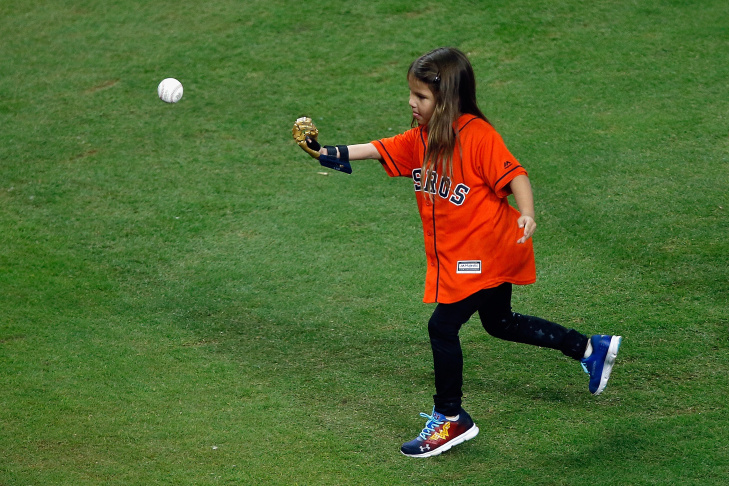 Hailey Dawson throws out the ceremonial first pitch before game four of the 2017 World Series between the Houston Astros and the Los Angeles Dodgers. 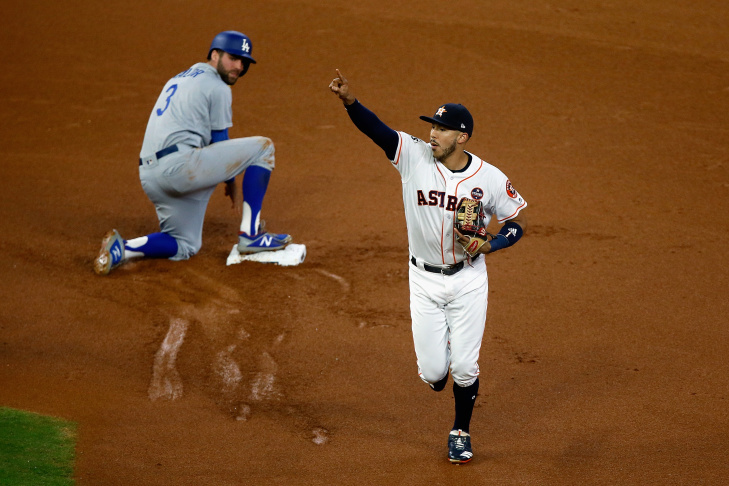 Carlos Correa of the Houston Astros reacts after tagging out Chris Taylor of the Los Angeles Dodgers as he is caught stealing to end the top of the first inning in game four of the 2017 World Series. 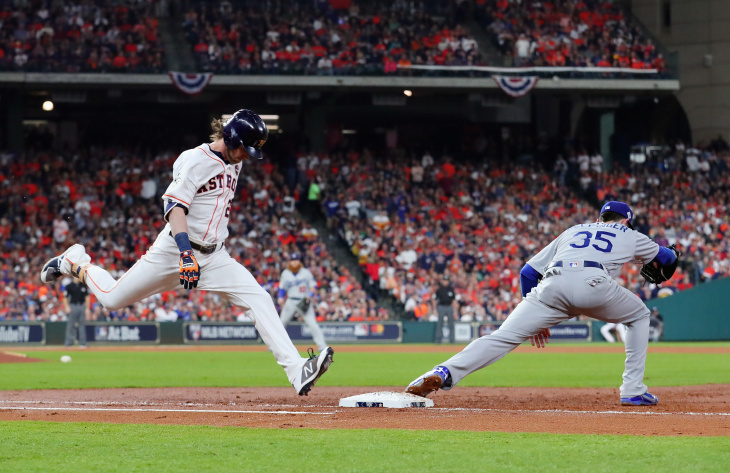 Josh Reddick of the Houston Astros is thrown out at first during the second inning against Cody Bellinger of the Los Angeles Dodgers in game four of the 2017 World Series. 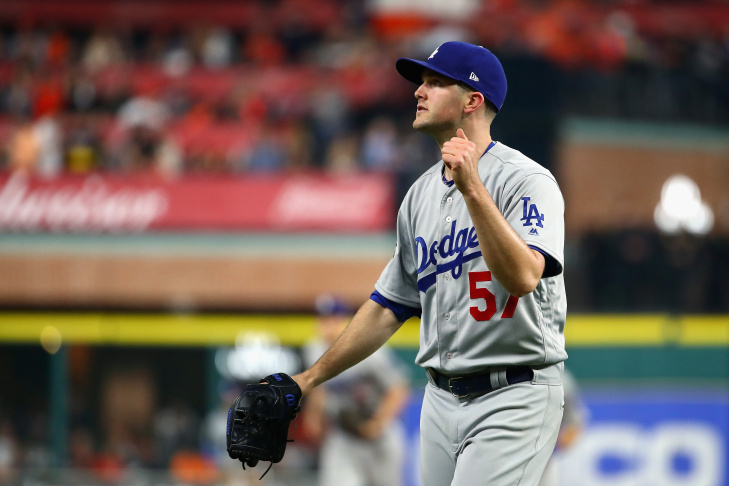 Alex Wood of the Los Angeles Dodgers reacts during the second inning against the Houston Astros in game four of the 2017 World Series. George Springer of the Houston Astros celebrates after hitting a solo home run during the sixth inning against the Los Angeles Dodgers in game four of the 2017 World Series. Logan Forsythe of the Los Angeles Dodgers hits a RBI single during the seventh inning against Will Harris #36 of the Houston Astros in game four of the 2017 World Series. 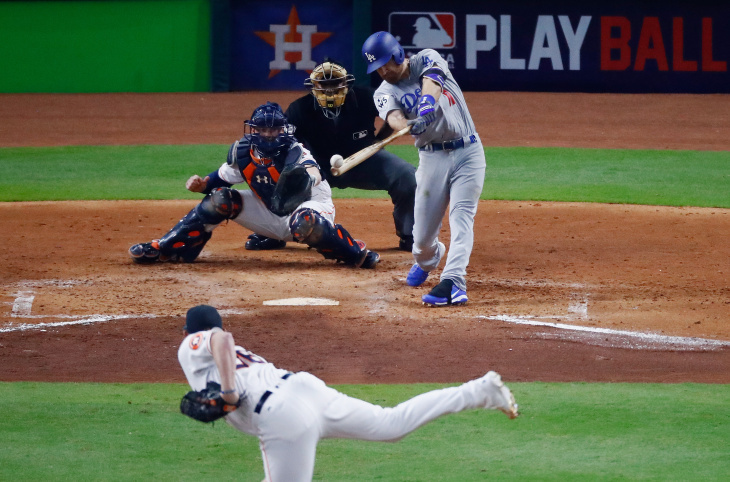 Cody Bellinger pulled into second base with his first World Series hit and said: "It's a miracle!" With the Dodgers three innings from falling into a deep deficit, the rookie slugger sparked a late comeback that stopped the Houston Astros' surge. Hitless in 13 at-bats, Bellinger doubled and scored the tying run in the seventh inning, then doubled home the go-ahead run off struggling closer Ken Giles in a five-run ninth that lifted Los Angeles to a 6-2 win Saturday night and tied the Series at two games apiece. 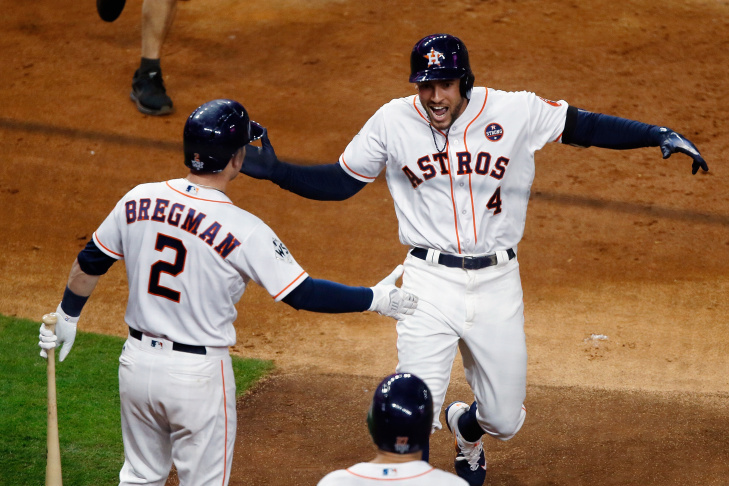 George Springer put the Astros ahead with a two-out homer in the sixth, the first hit off Los Angeles starter Alex Wood. 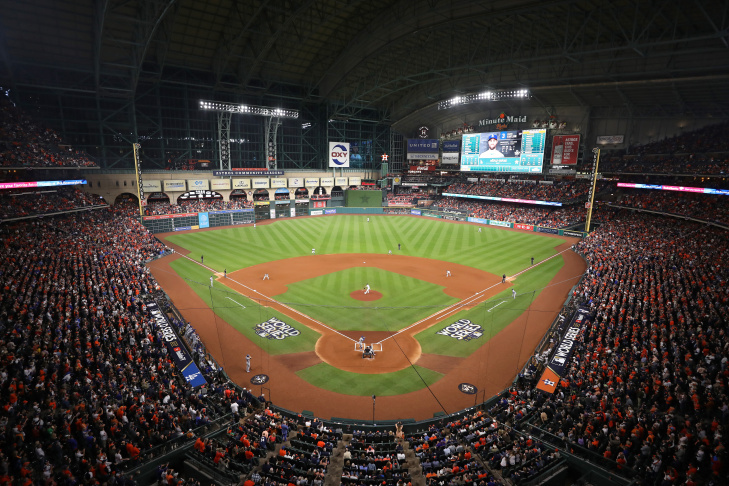 The crowd at Minute Maid Park, where the Astros had been 7-0 this postseason, was revved up in anticipation of the Astros having a chance to win the first title in their 56-season history on Sunday. Cody Bellinger of the Los Angeles Dodgers reacts as he hits a RBI double during the ninth inning against the Houston Astros in game four of the 2017 World Series. Bellinger, a 22-year-old bopper who set a National League rookie record with 39 home runs this season, struck out four times in Game 3 and once more in the fifth inning — his eighth whiff of the Series. Bellinger doubled over left fielder Marwin Gonzalez, chasing starter Charlie Morton, and came home on Logan Forsythe's two-out single off Will Harris. Giles entered to start the ninth and got into immediate trouble, allowing a leadoff single to Corey Seager and a walk to Justin Turner. Bellinger took a low slider, then lined a fastball at the letters to left-center. He raised a hand rounding first and clapped his hands half a dozen times in excitement after sliding into second. 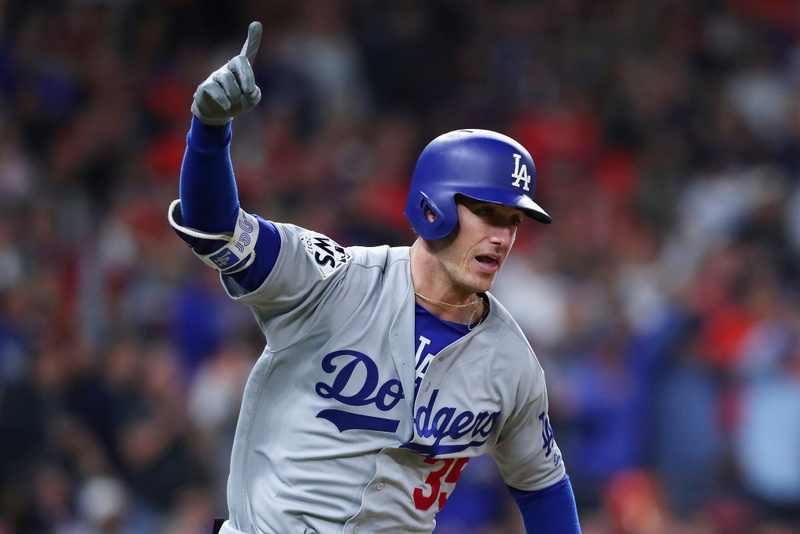 Joe Musgrove relieved and allowed Austin Barnes' sacrifice fly and Joc Pederson's three-run homer, his second home run of the Series. Wood, Brandon Morrow, winner Tony Watson and Kenley Jansen combined on a two-hitter. Jansen allowed Alex Bregman's two-out homer in the ninth, the 14th home run of the Series. Giles, the loser, was charged with three runs — he has allowed runs in six of seven postseason appearances.